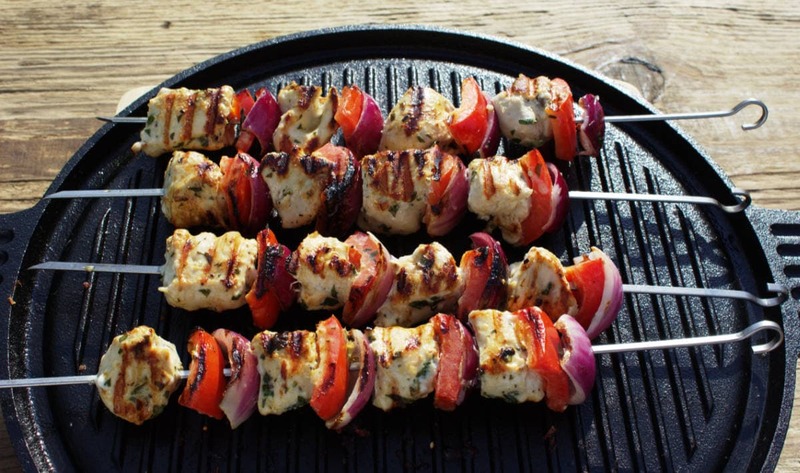 Homemade Chicken Kebabs : Perfect for the BBQ or under the grill! Homemade Chicken Kebabs. 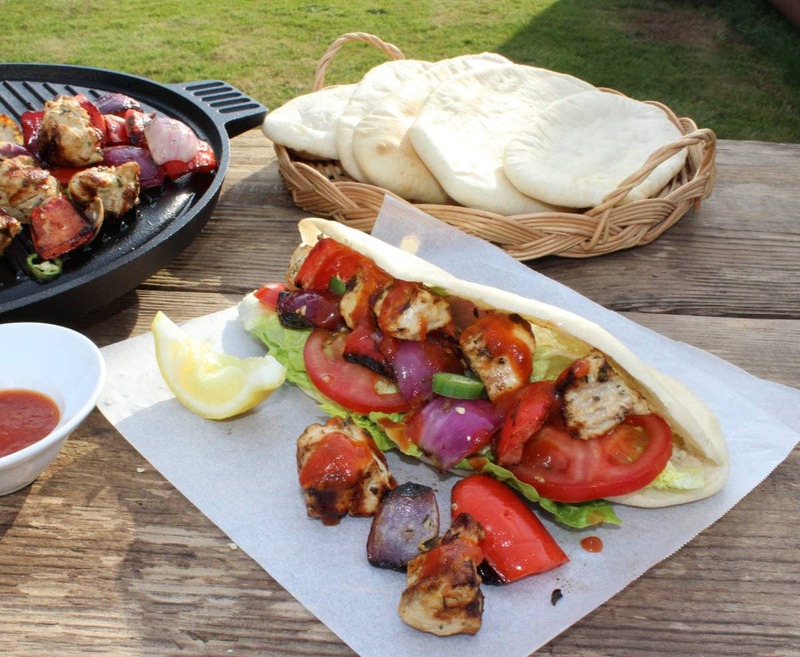 Freshly grilled marinated chicken, peppers and onions served in a pitta bread with salad & a hot chilli sauce. Healthy & delicious! 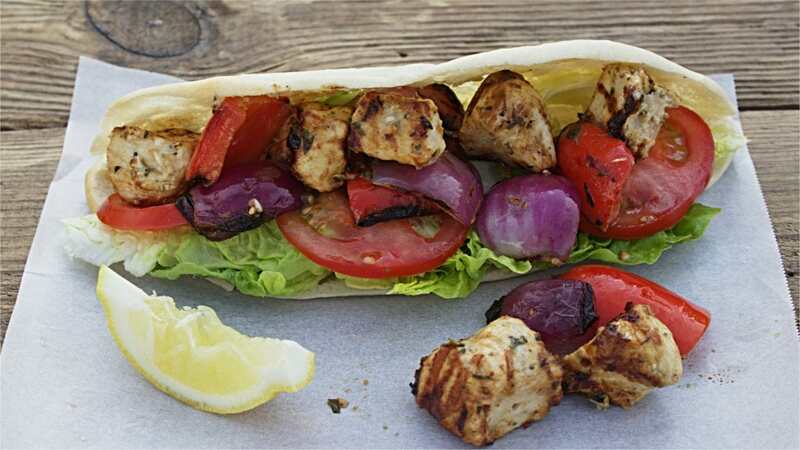 My favourite take away has to be chicken kebabs, an occasional treat for us all on a Friday night when OH and the boys would walk to the corner of our road and queue at the ever popular Turkish Kebab Shop. Freshly grilled chicken, peppers and onions in a pitta bread with salad, pickled red cabbage, hot chilli sauce and chips – irresistable ! I must admit, every now and then I yearn for a takeaway, maybe because we’re in rural Brittany at the moment with no takeaway nearby or maybe it’s simply the happy memories. Recreating our favourite treat and enjoying a Friday night takeaway in our field in France is alway a fun evening, cooking the kebabs on a portable gas stove at the table and eating al fresco. That said, in the winter or during summer storms cooking indoors still delivers a great tasty takeaway treat. 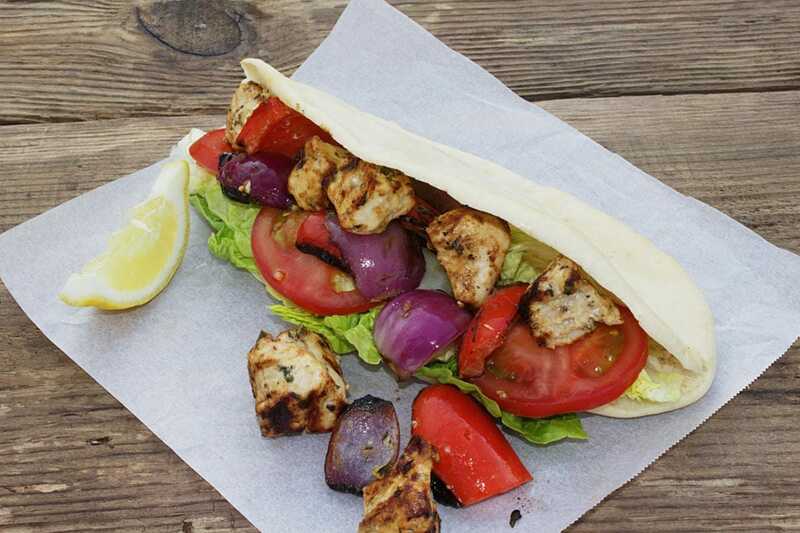 This healthy version of take away chicken kebab and chips is low fat and simple to make, having all the taste without the excess grease. I’m out of touch with the cost of shop bought chicken kebab and chips but I’ll bet it’s a lot more than this homemade version. Either way, you won’t miss your shop bought takeaway once you’ve tucked into Homemade Chicken Kebabs Take Away Style. 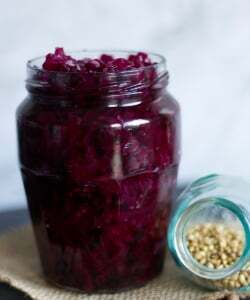 If you enjoy creating whole meals from scratch, I’ve included recipes for pittas, crispy oven chips (low fat with only a drizzle of oil), pickled red cabbage and even your own extra Homemade Chilli Sauce; the pickled red cabbage and the hot chilli sauce are best made in advance. 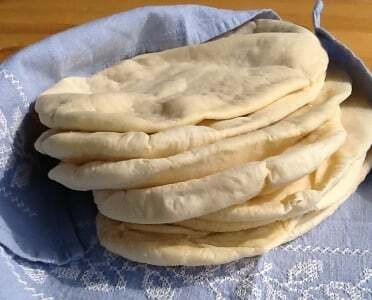 Pittas freeze well (and still taste much better than shop bought) so you can make them in advance too. The potatoes for the crispy chips can be prepared earlier in the day along with marinating the chicken so when it comes to cooking your Homemade Chicken Kebabs Take Away Style, everything is at hand and can be on the table ready to enjoy within thirty minutes. Pick your own recipe selection. Homemade Chicken Kebabs are so easy to make, simply marinate. And BBQ or cook on the griddle. Here’s the recipe in quick printable format so you can have it to hand while you try it out. 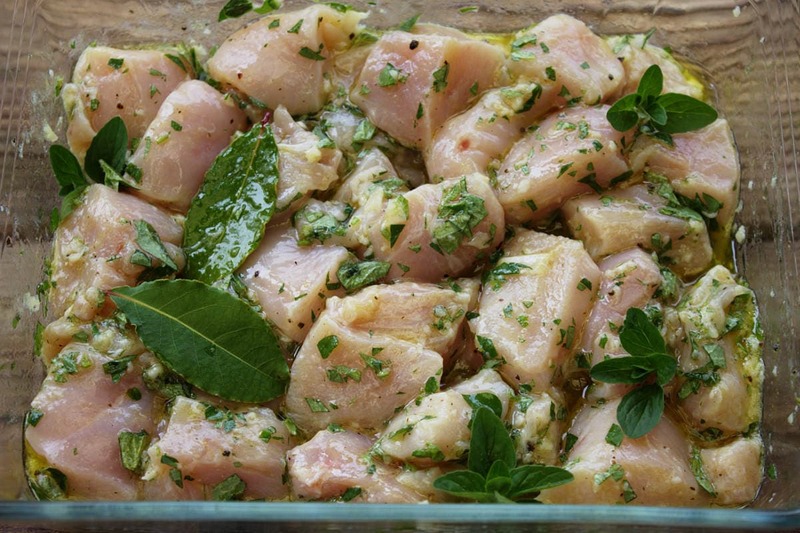 Mix the lemon juice, olive oil and crushed garlic before adding the bay leaves, freshly chopped oregano, salt and pepper. Add your chicken pieces and cover them well with the marinade. Transfer to a sealed container or food bag and place in the fridge for a minimum of 2 hours or overnight if you have time. Remove the chicken from the fridge and add the onion and pepper pieces to coat with the marinade. Thread a piece of pepper, then onion and then chicken on to a skewer and continue until you have 4 or 5 pieces each of pepper, onion and chicken. 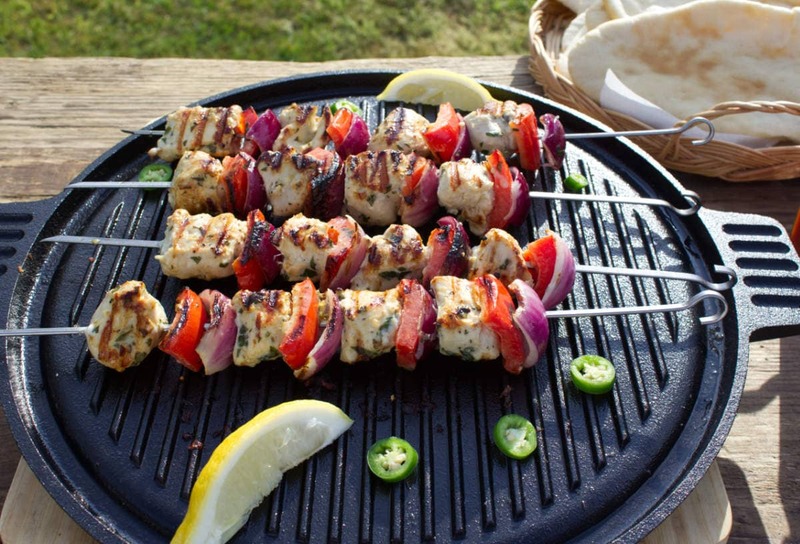 Cook your kebabs on a preheated griddle or BBQ for about ten minutes, browning on all sides. Add the jalapenos to brown, if using. 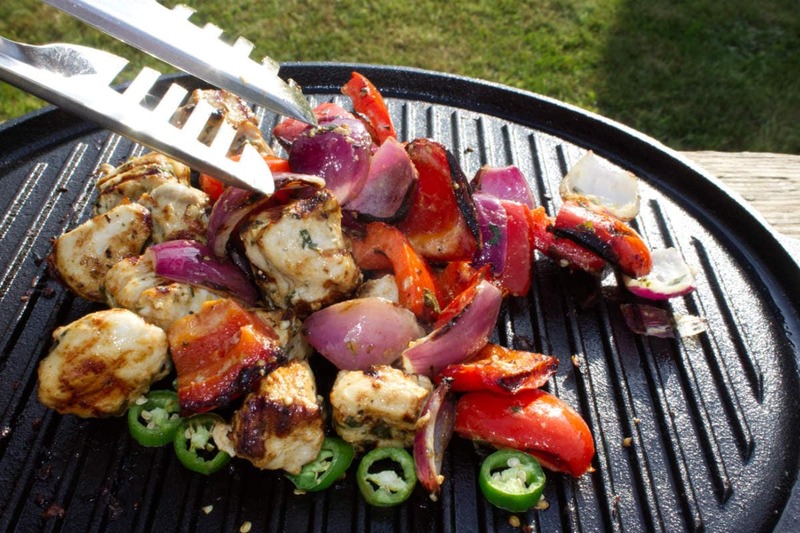 Slide the chicken, pepper and onion pieces off the kebabs on to the griddle or BBQ and continue cooking for about 5 minutes until the chicken is cooked through. Serve in a pitta bread, toasted if you wish, with shredded lettuce, sliced tomatoes, pickled red cabbage, jalapeno and a piece of lemon. 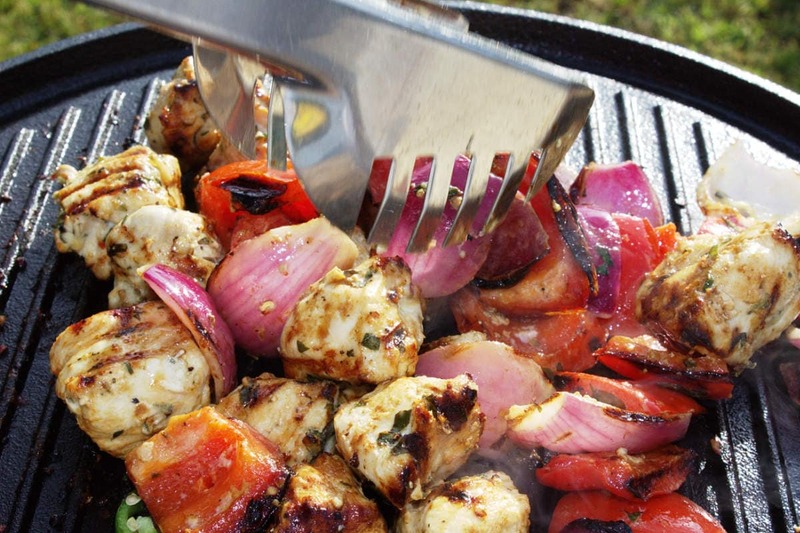 Flat metal skewers prevent the meat from slipping round on the skewer when turning so cooking is easier. If you're using wooden skewers, don't forget to soak them before use. The Spice Trail hosted by Vanesther over at Bangers & Mash where the theme is ‘Beach BBQ’. 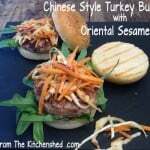 Ren Behan‘s Simple and in Season hosted this month by Elizabeth over at Elizabeth’s Kitchen Diary. I’ve made these a few times now and they really are delicious! Friends are always very impressed too, which is a bonus! Thanks Sarah, so pleased you and your friends have enjoyed Homemade Chicken Kebabs. Always happy to receive feedback on a recipe. You’re welcome Helen, it’s a pleasure. Yum! I love chicken kebabs and I like that you’ve included all the from-scratch recipes for yours. Love it! Thanks for sharing with Simple and in Season and Credit Crunch Munch! You’re welcome Elizabeth, the kebabs do taste better in a homemade pitta. Thanks Stacey, it’s well worth making at home. Thanks Teresa, I hope you enjoy them as much as we do. Would love to know how you get on. 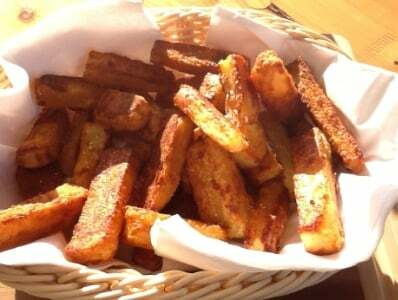 I said you chips look good or a girlie night, chips and kebabs look even better….yumm!! Thanks Saz, they would make a very tasty meal for a girlie night. Thanks Karen, look forward to taking a peek at the Cooking With Herbs round up at the end of the month. Thanks Vanesther & you’re most welcome. 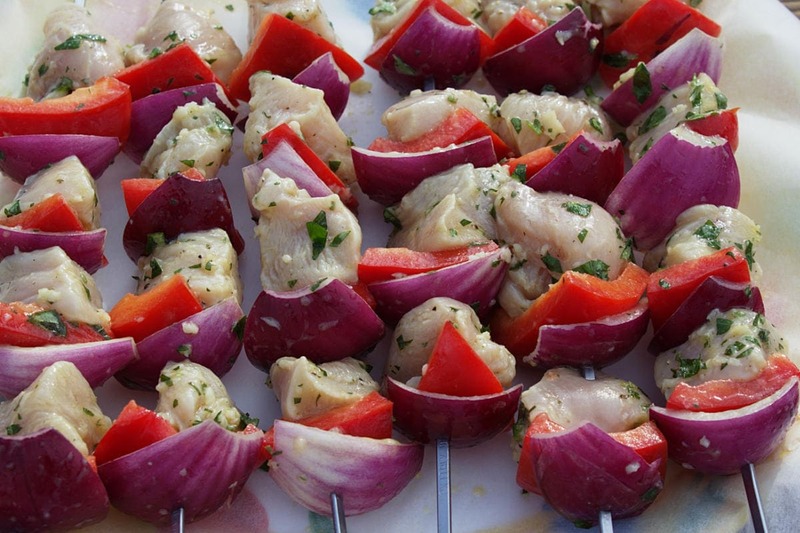 Chicken kebabs do make a tasty BBQ treat & by the beach would be idyllic. I can’t wait for our Scotch Bonnet chillies to be ready this year so we can stock up on our very hot sauce.